Western Leader was right to give a headline—“A mighty kauri falls..” and Radio Live’s Willy Jackson and John Tamihere dubbed him “….the greatest character in Maoridom…” and we in West Auckland would know him as the first Life Member of an Indian Association. The news of sudden passing away of KAUMATUA DENIS WILMOTT HANSEN hit the Indian community of Waitakere like a bolt of lightning. 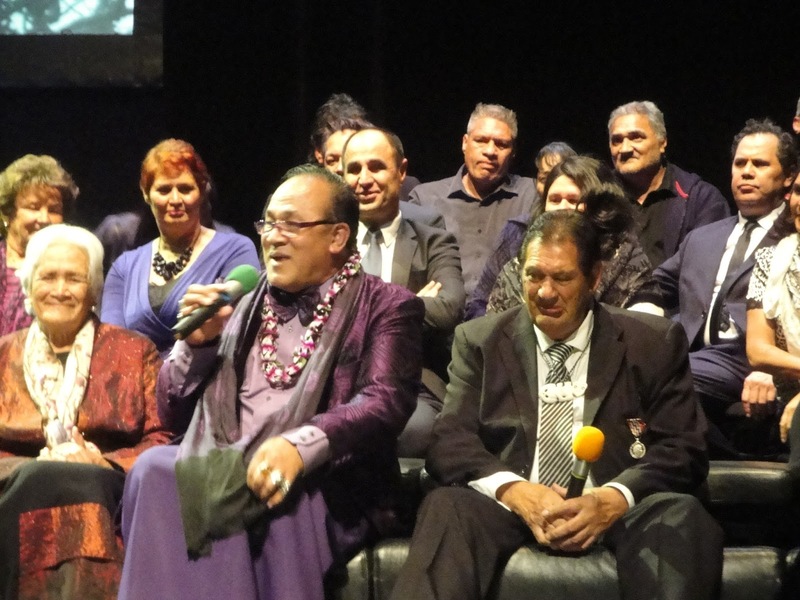 We had lost a friend, an elder, an Uncle, a Papa, a mentor, a relative and our link and communication to the Maori community. DENNIS WILMOTT HANSEN- an octogenarian whose 80th birthday was publicly marked by people of all walks of life at Civic Theatre, Auckland on 8 June, 2013. 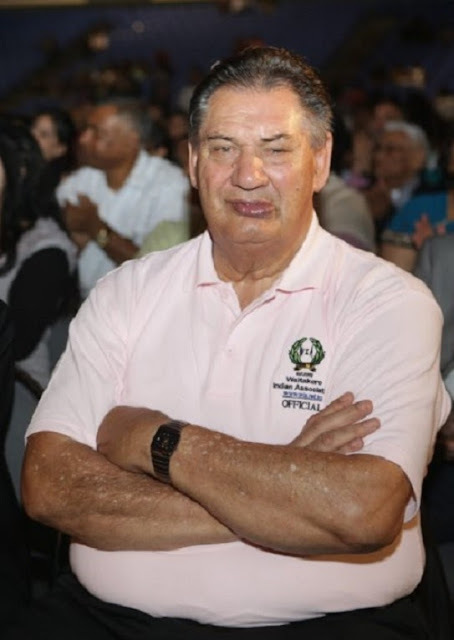 KAUMATUA DENIS HANSEN never felt like, or was ever treated as an outsider, nor did we in Waitakere Indian Association (WIA) feel he was not one of us. Whenever we had our functions and events, he was always there like a precious talisman of the Indian community, always present to give his blessings and prominent tall honoured presence. Be it Diwali, our social or Holi, our events were incomplete without him. 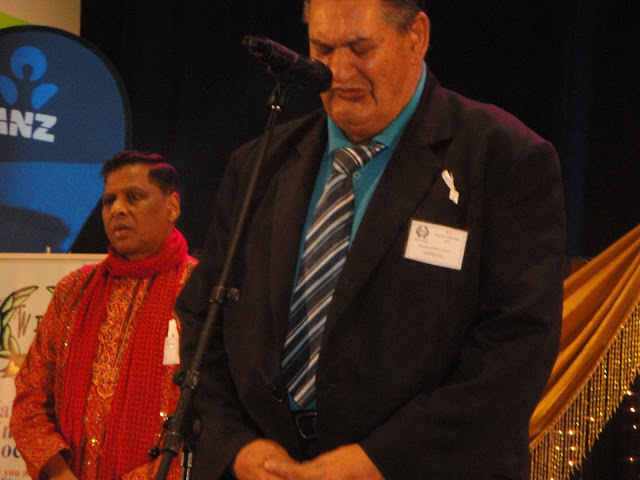 Papa Hansen -doing what he does best-Blessing Waitakere Diwali at Trusts Stadium last October. Any function of Waitakere Indian Association was considered incomplete without his blessings. 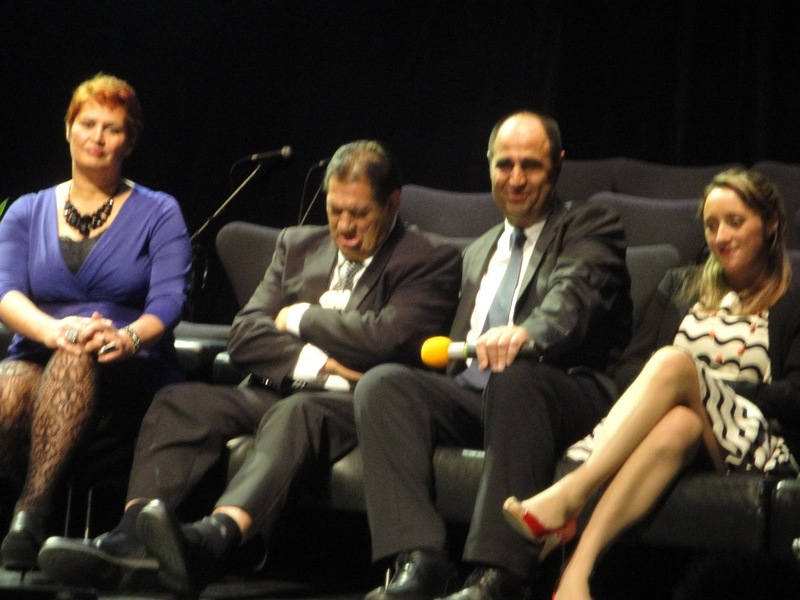 Just in our last AGM a few months earlier, it was resolved to make him a Life Member of WIA. Before this could be formalised, his call came. However, despite his passing away, Denis Hansen remains the first life member of Waitakere Indian Association posthumously. What an honour for WIA that it was not an Indian, but a descendent of an original settler, a Maori, who has the distinct honour of being a Life Member of an Indian organisation. He has been that fitting person to embrace that honour, in life, and in death, and does justice to the position. Some years ago, WIA members had visited Waitangi’s historical site and stayed overnight to get an appreciation of history with the blessings of Kaumatua Hansen. He has also helped Indians bridge the gap with Maori community in Rotorua and has worked closely with Hindu Council of New Zealand. 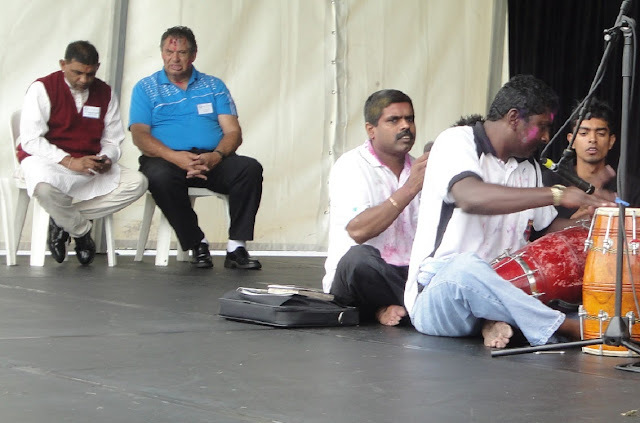 Papa Hansen (in blue), blessing and gracing his honoured presence at Waitakere Holi Festival last year. Waitakere Indian Association was having its Diwali meeting on Thursday September, 5, 2013. On Wednesday evening, Kaumatua Dennis Hanson’s close friend Mahendra Sharma Danny rang him, and left a message on his mobile, that it was his friend Danny reminding him of the meeting. Papa Hansen with his son-like close friend, Pundit Mahendra Sharma Danny, whose home was always open for this elder who was regarded as part of the family. Little did they realise that our beloved Kaumatua, our Maori link was not around to listen to that message. Our uncle and Kaumatua Denis Hanson was no more. We had lost him to an untimely death-untimely because despite being an octogenarian (80 plus), he was full of life, energy, action and most importantly, humour and practical jokes. Even in his death, he raised commotion. It was well summed up by Western Leader that Denis Hanson knew how to command attention in life--- and in death. The sudden heart attack caused his car to hit the road barrier at Lincoln Road off ramp that blocked North-Western Motorway for most of afternoon of Wednesday 4th September. Even his passing away was full of attention, but he went away without bidding us farewell. Part of Waitakere Indian Association delegation that attended his 80th birthday celebration, and did a special presentation at Civic Theatre, Auckland on 8 June, 2013. Dressed for the occasion are(from left) Messrs Manoj Tahal, Mahendra Sharma (Danny), Dhani Ram, Pravin Kumar and Master Sanjay Dutt Sharma. 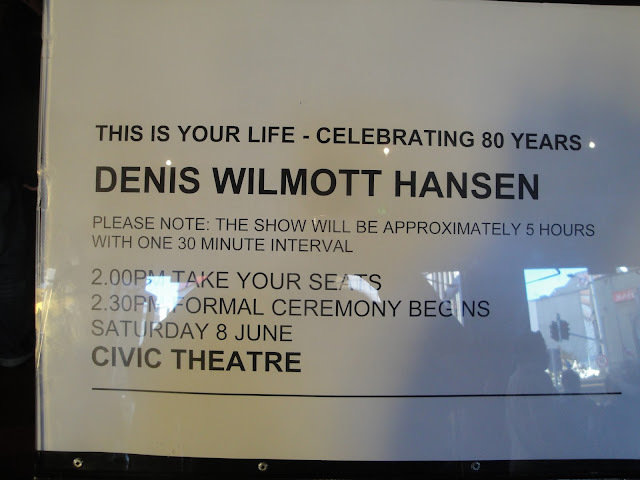 80th Birthday celebration at Civic Theatre - with Whanau, friends, well-wishers, contemporaries and close family members . I stressed that my grandfather was brought to Fiji to prop up agriculture. Therefore, the Indo Fijian migrants to New Zealand should not only be destined to running taxis and dairy shops, but could also help in developing agriculture in New Zealand and help in economic and agricultural activities. This could be done by utilizing thousands of acres of Maori land lying idle while Maori youths were involved in urban crime, drugs, gangs and wasting their lives away. There was much New Zealand could gain from the Indo-Fijian migrants whose real talents as farmers have gone begging. That is something that is on the planning board for discussion with Kaumatua Hanson and elders to forge an economic relationship which has hitherto escaped the notice of New Zealand leadership. 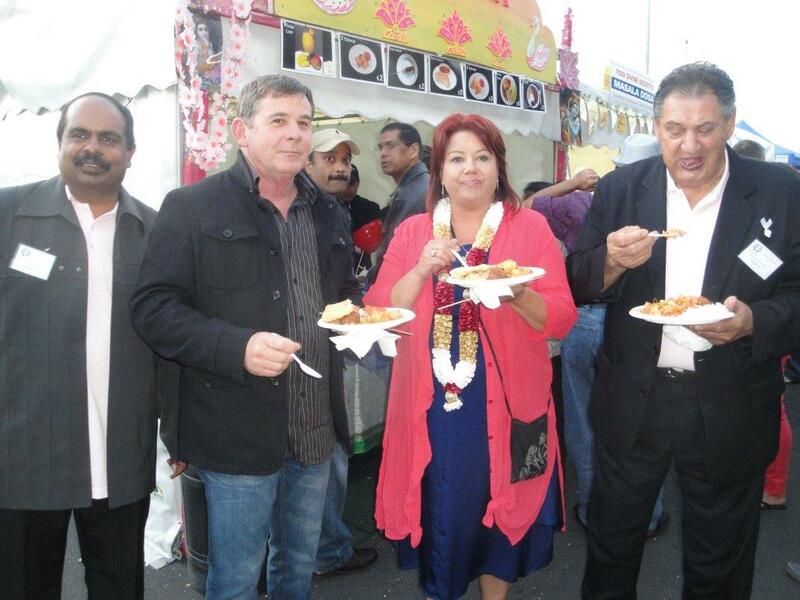 Papa Hansen (extreme right) having fun and sharing a meal at Waitakere Diwali Festival with Social Development Minister, Paula Bennett and friends. Papa's close friend, Danny, as he called Mahendra Sharma, is at extreme left. As is indicated by name tags, both Papa Hansen and Danny were parts of the Diwali Organising Committee. 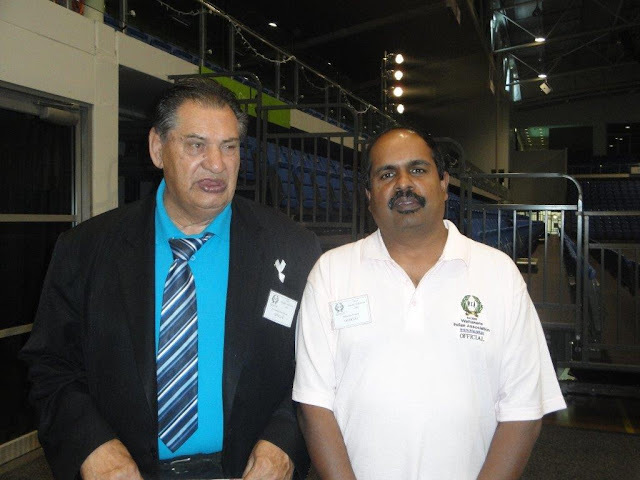 So close was Papa's relation with Waitakere Indian Association, that he was considered a part of the organisation, which has bestowed its first ever Life Membership to Papa Hansen. Alas, this may never be realised now, that the main architect is gone, but we have hope that Waipareira Trust and John Tamihere will still have that relationship and collaboration with Waitakere Indian Association in absence of Uncle Dennis. If nothing else, just to ignite the flame of integration that Uncle Denis fanned. 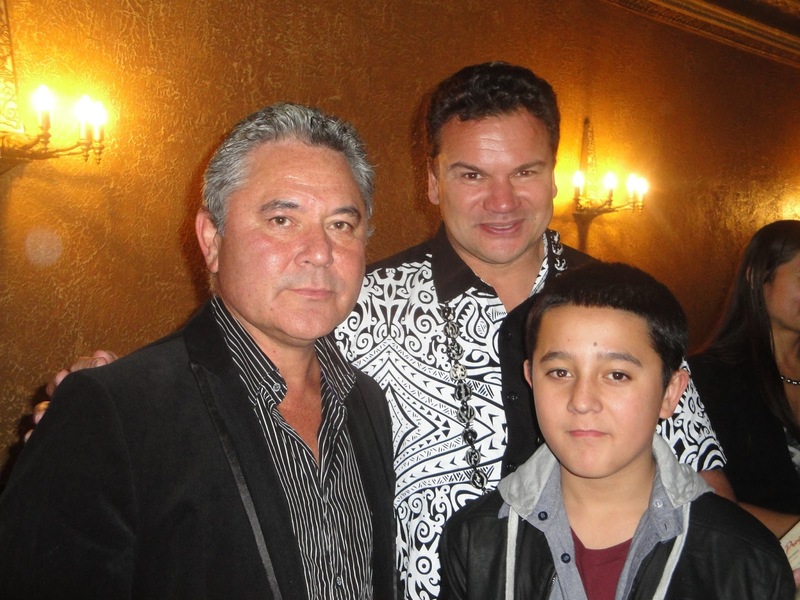 John Tamihere, CEO of Waipareira Trust (left) with friends at Denis Hansen's 80th birthday celebration at Civic Theatre. John has been a close friend of Papa Hansen, and and is vested with realising the dreams of Papa Hanson to work for the betterment of Maori and migrant communities and forge ahead with seeds of collaboration Kaumatua planted. Continuing this collaboration of migrants with Maori community has been the dream of Papa Hansen, and it will be a fitting gesture to continue in the tradition that this fallen Kauri planted as a seedling, that will produce many more Kauris. 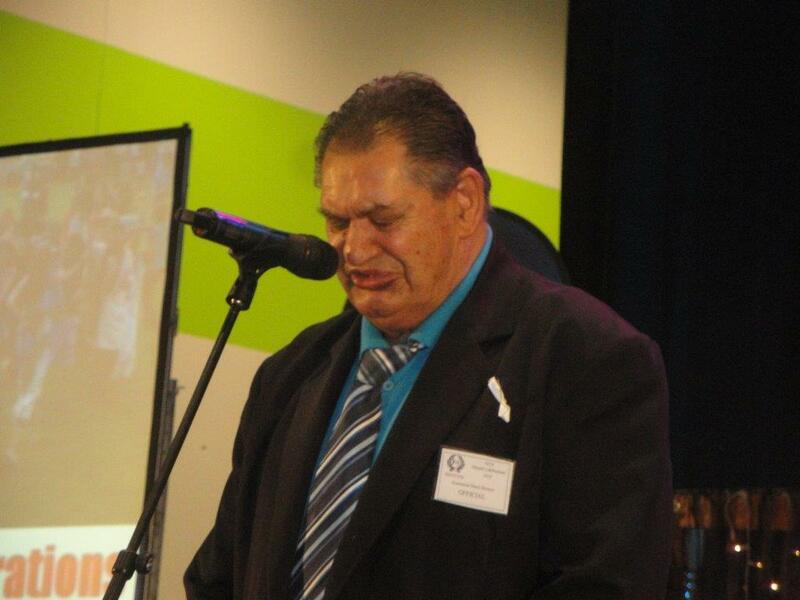 May his soul rest in peace and West Auckland gather strength to bear his sad loss and absence. So long Papa, may your soul rest in peace.